Did you know that if you were standing on the near side of the Moon, and your weight is about 80kg on Earth, due to Moon's lower gravity, you would not be heavier than 13kg? You knew? Ok, did you know that Earth's and Moon's gravities combined gave you different weight on near and far side of the Moon? Slightly yes, but true. Earth and Moon are relatively small celestial bodies but this difference goes even higher if you move from the Moon to the Io or Europe for example as they are also tidally locked by Jupiter just like our Moon is locked by Earth. This would most definitely not help mountains on Avatar's Pandora to float but still, within right conditions and with presence of large mass(es) nearby, considering appropriate composition of the ground I am sure there are solar systems out there with strange conditions to live with, to say the least. We simply take gravity for granted. We only know it here on Earth where it is stable and friendly, but up there within some, for example, triple star system with close by multiple giant planets orbited by dozen of rocky moons each, it would not be far from common sense for some intelligent insect-like aliens over there to build their calendars based on gravity changes instead of planetary motion. Maybe instead of "July" they have 'month' called "Joy" when everything is light and happy and for "January", who knows, maybe they call it "Despair" when due to heavy gravity their wings are useless and all of them are forced to spend the time on the ground playing monopoly. Well, aliens aside, when it comes to gravity it seems that it indeed is the last frontier in our understanding of the universe and our search for the ultimate theory of everything. Is it force like any other and eventually we will find gravitons that will fit perfectly within well known particle model? Will it be some kind of space time continuum property just like perforated highways in vacuum that is used for object's motion? Or the final description of gravity is still waiting deep below within quantum world and string theories. Or maybe it is something entirely else. Whatever it is, I am sure a day in the future will come when we will learn everything about it and maybe this breakthrough discovery will reveal the doors with possibility for solving more mysteries waiting in line, like dark matter and dark energy and perhaps even provide a ways of how to efficiently test all the theories that predict existence of multi-universes and multi-dimensions. If we look into our scientific past, it was always like that. Every scientific breakthrough is made on shoulders of another. This is exactly what sir Isaac Newton meant when he wrote a letter to Robert Hooke in February of 1676 and said "If I have seen further it is by standing on the shoulders of giants". Although, if we dig more in the history of two scientists and rivals of the time it is more than possible that Newton meant more with this quote than just it's pure meaning from 12th century originated from Bernard of Chartres. I know it is not really easy to make a short list of favorite scientists in the past that perfectly followed Bernard's simple truth but, you guessed, I will try nevertheless. I also decided to follow short story from last year called "Jules, Isaac, Arthur and Carl", about Sci-Fi novelists and science journalists and similarly I will choose only four scientists I think they were and one of them still is living and working simply ahead of their time and represent true pioneers in scientific community. With one exception. The very first one in the list is Giordano Bruno, Italian philosopher and mathematician who lived in second half of 16th century and literally gave his life for science and free thought. Understanding heavens in his time was challenging to say the least. Catholic Church found him guilty for heresy and on February 17, 1600 he was burned alive in Rome's Campo de' Fiori square. Inquisition put him on trial for his belief that Copernican model is only wrong because it includes center of the finite universe in close proximity of one celestial body. There is no center and universe is not finite, he said way too loud. Simply put, in 16th century, the only outcome of publicly saying that universe is infinite with no center whatsoever and that Earth is just one of wandering "stars" - were inquisitors knocking on your door accusing you for denial of everything holy and divine. Giordano Bruno died in dawn of 17th century and he, along with lots of other scholars in dark ages and those before Christ, represent the base of what we call today modern science. His name in my list merely impersonates all the scientists from old Greek, Persian and Egyptian era starting with Democritus, Eratosthenes, Aristotle, Ptolomy, Hypatia, Azophi followed by Giordano's contemporaries Galileo, Copernicus, Brahe and Kepler and many others. These people are the giants from Bernard's and Newton's quote. Every single one of them made a step toward final understanding of the Universe and how it really works. Even when they weren't right because of lack of precise tools and instruments or simply because of false interpretation of natural laws, their theories revolutionized the ways of thinking and provided next giant in the chain to continue the path. Perhaps the best illustration of how one scientific chain of thoughts is evolving in time is how 'chain of giants' were dealing with discovery of gravity and understanding oh how it works. Started with Aristotle and Ptolemy, planetary motion and relations in general between distance, speed and time of a moving body culminated with Galileo and Kepler who discovered basic principles and proved first theories in experiments. It was first half of 17th century when almost all scientists of the time accepted heliocentric system and started to understand that motion of a projectile is not that different from the motion of one big celestial body, like Earth's around the Sun. By the time Isaac Newton started to write his famous "Principia", everybody accepted the big picture of the system in works. That one celestial body is maintaining complex motion around its own axis and orbiting larger one in elliptical path. Nobody knew why though. And how. Newton simply provided next step in the chain with his law of universal gravitation. What he mathematically presented is how gravity force acts between two bodies. No matter how big they are, attraction force between every two masses exists and can be described with simple formula in relation of their masses and distance between them. If you were a student of astronomy, with knowing only this law, combining with Kepler's third law of planetary motion that connects time with elliptical property and with known motion and masses of planets in Solar system, you would easily be able to calculate the path of a small spacecraft launched from Earth toward some destination in outer solar system using little rocket fuel and only gravitational forces of planets during flybys and temporary orbits. And all this calculations would be based on formulas almost 400 years old! With Newton we now know why bodies attracts to each other, but we still don't know how they do that. Within particle physics, today we know great deal about how 'forces' perform or how they operate deep down inside atoms. In other words, each force is produced by fundamental particles that act as carriers of the force. Like photons that are carriers of electromagnetism. Various experiments in large particle accelerators also detected carriers of strong and weak nuclear force but gravitons are never found. Whether or not they exist or we are still missing something fundamental that will explain gravitational 'force' or whatever it is, time will tell. However, after Sir Isaac, one more giant stepped to the scene last century to add more light to the gravity phenomenon. You guessed, it was Albert Einstein with his theories of relativity. Even thought Newton's law works perfectly in both small and big scale, great scientist failed to understand relation between mass and space and time continuum, He was convinced that time is absolute and that space is fixed and they both have nothing to add to the system operating within. 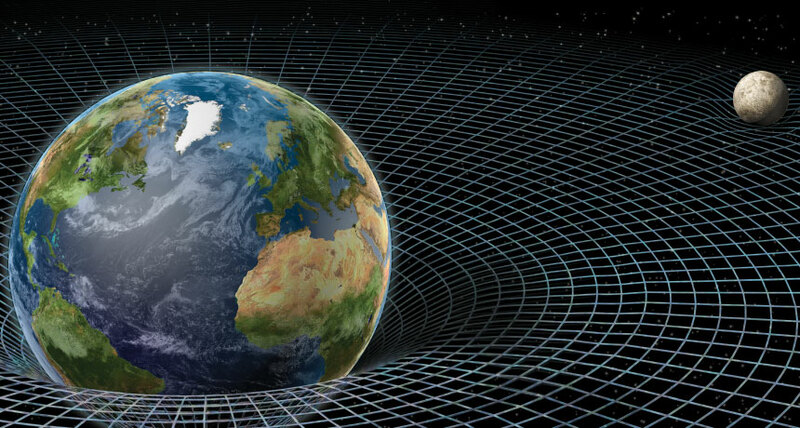 Einstein's general theory of relativity goes one step further and provides mathematical equations of flexible space-time that simply bends in presence of large mass. Not only that, but mass of some body is also flexible and depends on the motion. It increases with acceleration in speed and it goes toward infinity if the mass tries to travel with speed of light. The saga about gravity continues and if you ask me, I have a feeling that gravity is more than a force. Acts like one for sure, but maybe, just maybe, there could be a bigger story waiting to be revealed in the future. Something that would open the door for more questions and pending answers. 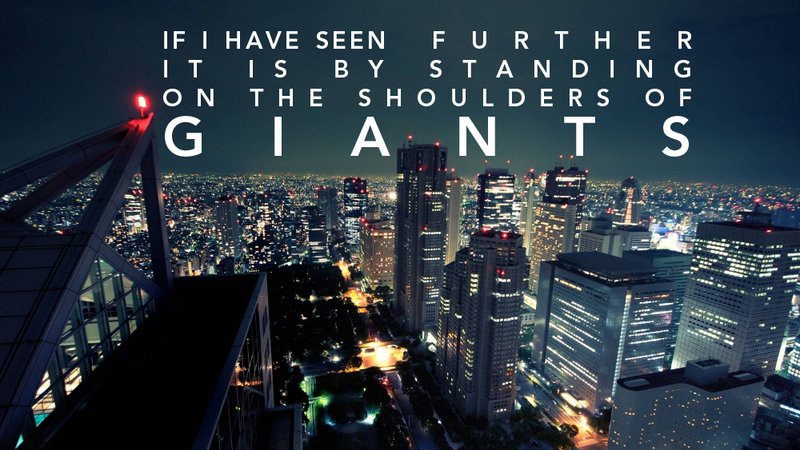 As it seems this story focus is on 'giant's from Bernard/Newton quote, especially for their contribution in understanding 'the heavens' and it is surely hard to pick just few of them over the centuries in the history of modern science. Perhaps, the best description of how and where scientific community evolved in today's phase I read at 'The Official String Theory Web Site':"Science in general and physics in particular rely on the strength of an entire community of critical partners in slicing and dicing through speculation and fantasy to get to the part where we start effectively describing Nature". Perhaps, the scientific world after Newton and Einstein changed toward pure theory-proof approach, while before, due to lack of precise tools and credible experimentation it was not easy job to distinguish scholars between true scientist and plain philosopher. In conclusion, after picking Giordano Bruno to represents all true scientific minds from Aristotle to Newton, emphasize Isaac Newton and Albert Einstein as one of those brilliant minds who gave breakthrough contributions and enlighten the path for next generations, I feel that would be only unfair not to mention Niels Bohr for his breakthrough in understanding atoms and subatomic particles, James Clerk Maxwell for his theory of electromagnetism, Richard Feynman who dug more than anyone into quantum world and many more who lived in past two centuries. Lastly, among all the living scientists today who are walking among their paths today on the shoulders of their great colleagues from the past, the job of picking just one whose name would easily represent the entire community is fairly easy. It's Stephen Hawking. What slightly distinguishes him from Roger Penrose, Steven Weinberg, Peter Higgs, John Ellis, David Gross, Edward Witten and all the others who are actively searching for the ultimate theory of everything, was his work on mathematical description of black holes and breakthrough discovery of their radiation within research of general relativity. And, of course, because of his book "On the Shoulders of Giants" with original texts from famous scientists and their publications. It is amazing to learn about personalities and chain of thoughts of great minds who lived 400 years ago. Highly recommended. Published on February 20th, 2015, Updated on PI day - 3,14 2018. 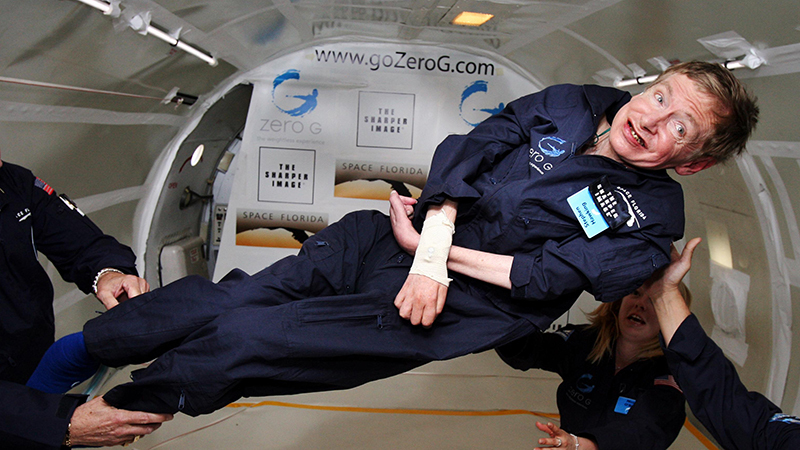 RIP Stephen Hawking.